When Jeff Scheetz' 'Behind The Mask' arrived in my post, my first question was, 'Where do I know this guy from? Well, the errors of youth and subsequent advance of middle life have not completely dulled my memory. I remember Jeff Scheetz and his two early fret-fests 'Woodpecker Stomp' and 'Warp Speed' from the early 90's. Yeah, that's nearly 20 years ago and I know I had those discs at some time: really great stuff. Happily, I get the opportunity to reacquaint myself with this outstanding guitar technician, and it seems time has been kind to Scheetz. On 'Behind The Mask,' you will discover that Scheetz has evolved in two ways. First, it appears that he is more likely to play with a band and two, the days of the guitar slinging lay-waste-to-your-ears shredding has become passe. Don't get me wrong: Scheetz can still bring the fire, 'Spiny Norman' is an example of it. However, what we have on 'Behind The Mask' is a rich, nearly eclectic, variety of guitar expressions including rock, funk, blues, jazz, country and, most often, a fusion of two or more. Scheetz is able to handle all styles with precision and aplomb. 'Welcome Home' brings funky blues as does the lively 'Letters to Myself;' Scheetz and company deliver nearly flawless traditional blues on 'Killin' Time;' the aforementioned 'Spiny Norman' visits so much different territory that I would call it progressive guitar rock. The innovation is quite overwhelming and seemingly endless. Therein lies some of 'Behind The Mask's obvious flaws. This is a long album; it will take you some time to listen and comprehend all 14 tracks, and will probably require more than one listen. Additionally, some tracks, though genuinely creative, are mercilessly too long, the plodding 'Behind The Mask' for one, or merely derivative to average including 'Like You Are Alive' or 'The World.' Then there's that Elton John cover 'Don't Let The Sun Go Down On Me' which, except for Scheetz' delivery rivaling the smoothness of a young Santana, is horridly dull and unflattering of the original. As I maintained concerning AC/DC's 'Black Ice,' a little trimming here and there would have made for a better work. Overall, however, 'Behind The Mask' was a fine re-introduction to the inspired skills of guitarist Jeff Scheetz. Scheetz is one virtuoso who has not rested on his early achievements and so bore us with redundancy. No, this is an artist who matures, excels and achieves only to prove that the depth and breadth of his work is still evolutionary. 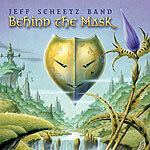 'Behind The Mask' was a fine re-introduction to the inspired skills of guitarist Jeff Scheetz. Here is one virtuoso who has not relied on his early achievements with the expectation that he would grow as an artist and so bore us with redundancy. No, this is an artist who matures, excels and achieves only to prove that the depth and breadth of his work is still evolutionary.